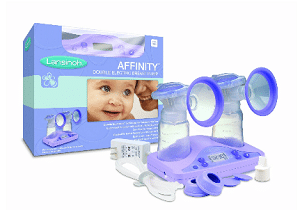 The Lansinoh Affinity double electronic breast pump is one of the more affordable options that many new mothers consider. Not every mother has the luxury of purchasing an electric pump that costs a few hundred dollars or more. There are many benefits to spending that kind of money on a double electric pump if you have the budget and will be pumping daily or more than once a day, but many new or expectant mothers have to settle for something a bit lower in price. The closed system simply means that the milk is prevented from backing up into the tubing of the machine. When milk flows into the tubes it is very difficult to clean out and can become a sanitation hazard in the future. It is also just a big hassle to clean up, especially when you are trying to express milk or get fresh milk stored away for later use. The adjustable speed and intensity covers the very basic features to be expected on an electric pump. You can adjust these settings to mimic the sucking intensity and patterns of your own baby. This may help with expression and definitely makes the pumping process a lot more comfortable. What you won’t find on the Lansinoh Affinity breast pump are a lot of advanced features that come with many higher priced electric double breast pumps. This has to be considered when you are purchasing a lower priced product selling for half the cost of other models. If you simply cannot afford a pump with all the bells and whistles, make sure to compare this one to others selling within the same price range. You may also be able to get a more expensive (and higher quality) pump for about the same price as this one, if you shop around online. 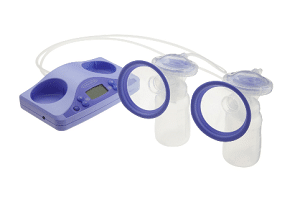 What are Others Saying about the Lansinoh Affinity Pump? There are a lot of positive consumer reviews for this pump. Those who understand that they are purchasing a lower priced model with very basic features tend to appreciate the convenience in this design. They like the closed system and the fact that there are not a lot of parts to clean up at the end of a pumping session. They may also appreciate that it is a bit quieter than many other pumps. Yet, there are some complaints from users who have difficulty getting the suction they need to completely express all of their milk. Those who compare the Affinity to the pumps they used in the hospital also seem to be disappointed, since they expected the same quality of suction and comfort. Unfortunately, you simply cannot expect that when you are paying less than $200 for a double electric pump. Hospital pumps sell for hundreds of dollars, so they naturally have better features and suction. This Lansinoh double electric breast pump retails for around $149.99, but you can often find it online at lower prices at places like Amazon.com. 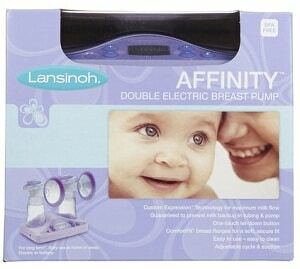 The Lansinoh Affinity is better as an occasional or back up pump than a full time constant use pump.